The Chevrolet Suburban is a large SUV from Chevrolet. It is the longest-lived continuous automobile nameplate still in production, dating from 1935. The Suburban has been produced under the Chevrolet, Holden, and GMC marques until the GMC version was rebranded as the GMC Yukon XL. For most of its recent history, the Suburban has been a station wagon-bodied version of the Chevrolet pickup truck, including the Chevrolet C/K and Silverado series of truck-based vehicles. Cadillac offers a version called the Escalade ESV. 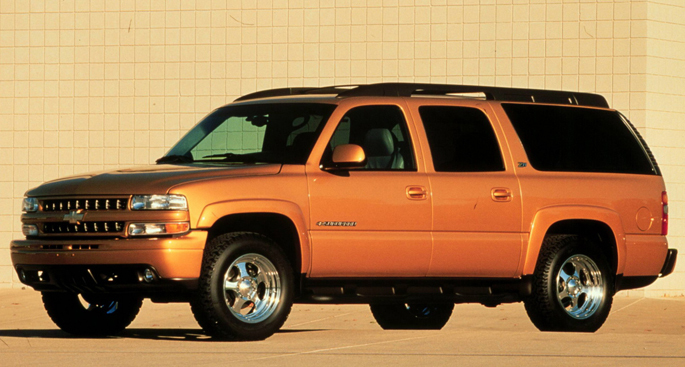 The Suburban has traditionally been one of General Motors' most profitable vehicles. After serving faithfully for many evolutionary years as a truck primarily meant for commercial or rural use, the extra-large Suburban has increasingly become the go-to choice for families or those in need of class-leading passenger and cargo capacity, third-row seating and solid truck-based towing capability. A short list of competitive sport-utilities may offer more refinement and ultra-lux conveniences for more bucks, but the big Suburban (as well as its GMC equivalent, the Yukon XL) remains the only full-size SUV available in both light- (1500) and heavy-duty (2500) versions. The Chevrolet Suburban full-size SUV is available in three well-equipped trim levels: base LS, well-equipped LT and luxurious LTZ. All are powered by V8s. Standard on the half-ton Suburban 1500 is a 5.3-liter unit making 310 horsepower and 340 pound-feet of torque, equipped with GM's fuel-conserving cylinder-deactivation technology. Optional on the 1500 is a 6.0-liter V8 packing 366 horses and 376 lb-ft; the Suburban 2500 comes standard with a different variant that is tuned for even more torque and thus makes 352 hp and 382 lb-ft. All are matched to a smooth and cooperative six-speed automatic transmission. 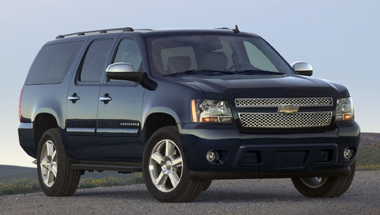 For such a big truck, the Chevrolet Suburban is relatively quick when unloaded and can reach 60 mph in under 9 seconds. However, the base V8 Suburban doesn't always feel so quick when carrying a load of power- and fuel-sapping stuff. The suspension system is impressive, though - coil-over shocks up front and a five-link setup out back, plus precise rack-and-pinion steering - that all make for more composed handling and a smooth ride. All the engines offer Flex Fuel capability, meaning they will operate on gasoline or E85, which is 85-percent ethanol. 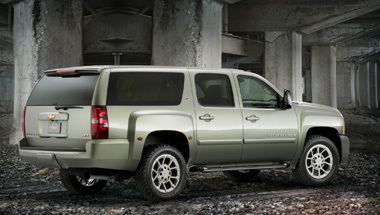 The Suburban has a square-jawed face that's smooth and rugged at the same time, a twin to the shorter Tahoe. The mesh grille available at CARiD.com is split by a gold Chevy bowtie, and the daytime running lights use separate lamps and can be switched off for after-dark campground arrivals. The bumper fascia reveals a low license-plate holder sandwiched by openings for tow hooks, with small round fog lamps at the corners like single teardrops falling from the headlamp eyes. The seam between the fascia and fenders is very tight, and a good indication of GM's solid body quality on the current generation of trucks. Although the lines remain the same, the Suburban's ultimate appeal depends on which trim level and wheel style and size you choose. Some are nearly void of chrome while the Z71 adds machismo with sizable fender flares and side steps so short drivers can get in and tall ones can mess up their pant legs. The standard wheels are five-spoke, 17-inch and 20-inch aluminum. Polished wheels are also available. Also available the Chevy Suburban Accessories that look good, and can accentuate the exterior appearance of your vehicle.